1 Mandarin Orange Clementine, or Tangerine, peeled and separated into sections. Prepare salad greens, fruit, cheese, onion & tomatoes by arranging on chilled salad plates. To make the vinaigrette, thoroughly whisk vinegar, oil, salt & pepper in a small bowl. Whisk until the oil and vinegar has emulsified. 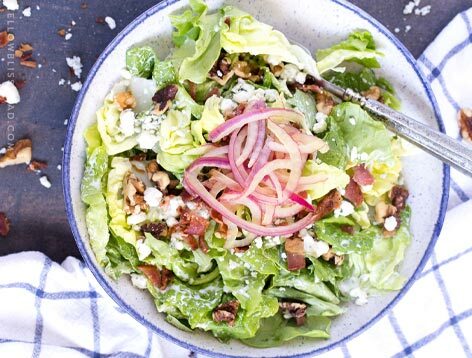 Pour over the prepared salad, top with optional chopped nuts and serve immediately.